Fact: Lookout Mountain is the southern most mountain in the Appalachian chain. Opinion: Lookout Mountain is beautiful, and well worth a visit. 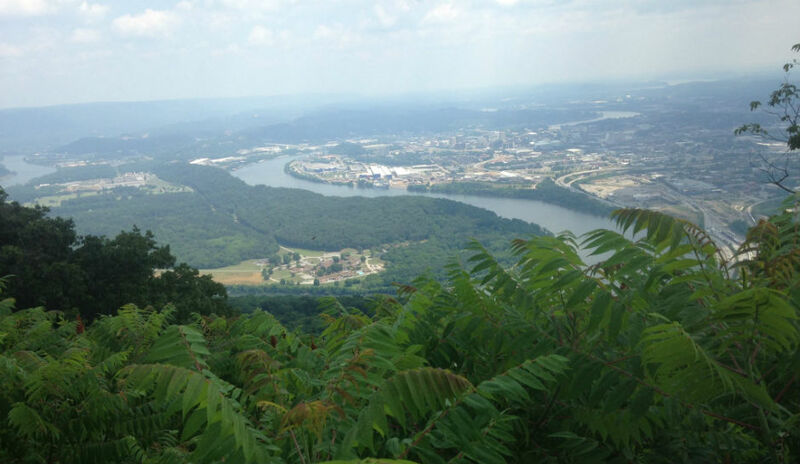 My family and I recently went to Chattanooga, TN, on vacation, and we went up Lookout Mountain three times. The Chickamauga tribe of Cherokee called the mountain Chat-a-nu-ga, from whence comes the name of one of Tennessee’s prettiest cities. It was the site of one of the most famous battles in the Civil War, the Battle Above the Clouds. First, we rode the Incline Railway up the side of the mountain. It’s the world’s steepest railway, with a 72% incline, giving a breathtaking view as you ride up the mountain. There are gift shops and overpriced eateries at both top and bottom. Once at the top of the Incline Railway, it’s a short walk to The Battles for Chattanooga and Point Park. 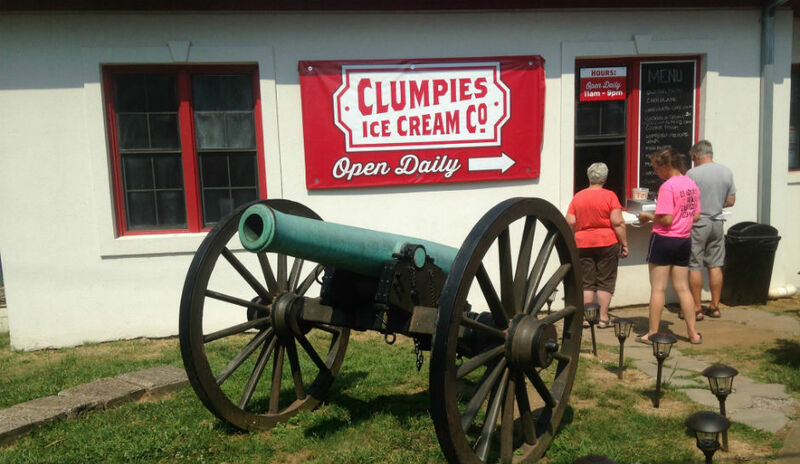 The Battles for Chattanooga is a small Civil War museum in Lookout Mountain, TN, next to Clumpie’s Ice Cream. Using an electronic diorama, it demonstrates the course of events for November 1863. Point Park is very small, but the view is outstanding — equal or better to what you would see at Rock City or Ruby Falls. There’s a slight fee, but your admission ticket is good for a week, so we came back a few days later to visit the Ochs Museum (which focuses on Civil War communication). However, the Incline Railway only takes you up and down the mountain. It does not take you to Ruby Falls or Rock City, so once we’d seen where my great-great-grandfather fought, we bought some souvenirs and went back down again. We had lunch at a local pizzeria called Mr. T’s, which I can not recommend too highly. Then we drove up the mountain — a very twisting road, I wouldn’t want to drive it in icy conditions or during a bad rainstorm — to visit Ruby Falls. Lookout Mountain, stretching over Tennessee, Georgia, and Alabama, is huge. It has several caves. One of them is Ruby Falls, which is famous for its 145 foot underground waterfall …1,120 feet below the surface of Lookout Mountain. There are guided tours, and from his jokes, I think our tour guide used to work at the Jungle Cruise in Disneyland. The falls aren’t actually ruby-colored, of course. They have colored lights shining on the water as it falls down. The stalactites, stalagmites, and columns are beautiful. Stalactites hang tightly from the cave roof, stalagmites might grow up there someday, and stalaglites are the electric lights attached to the cave walls for safety. Ruby Falls has a children’s play area, where the younger ones can burn off some energy. Allow an hour and a half for a visit, and wear good walking shoes. Ruby Falls is always 60°, so it was the only place on our vacation where we wore jackets. It has an excellent gift shop, but you might want to save your souvenir buying until you go to Rock City. Ruby Falls is on the Tennessee side of Lookout Mountain; Rock City is on the Georgia side. Georgia sales tax is cheaper than in Tennessee. We went back up Lookout Mountain a few days later. First we obeyed all the barn roofs and birdhouses and went to ‘See Rock City,’ then we went back to Point Park to visit Ochs Museum. Rock City is a carefully landscaped rock and wildflower garden, combining natural geologic formations with beautifully designed gardens, gnomes, statuary, and a deer park. There are, of course, multiple gift stands and high-priced eateries. One of the many Rock City gnomes. At the Battle Above the Clouds, both a Union officer and a Confederate nurse wrote in their diaries that they guessed one could see seven states from that viewpoint. Wikipedia says no, but Rock City claims you can. The view is astounding. And here’s the See Seven States lookout plateau, as seen from a distance. In good weather, the view is awful in the archaic sense of the word — full of awe. Awesome. Rock City is a fun place for the whole family, but A, make sure you wear good walking shoes, and B, if you’re chubby, be careful. There are some areas where the rocks are very close together, including one canyon called Fat Man’s Squeeze. I have some friends who are on the hefty side, and I honestly don’t think they could get through. Be sure to bring money for souvenirs and food. The food is not cheap, and the souvenirs were very tempting. Leatherwork, garden gnomes, jewelry, books, fudge, birdhouses, DVDs, and more. Many thanks to my son, who took the second Ruby Falls picture and all the Rock City pictures. We’ve just returned from a family vacation in Chattanooga, Tennessee. I’ll do a full travelogue later, but for now, a restaurant review. Being forced to eat out every meal (except for the barely adequate continental breakfast at our hotel), we had pizza three or four times. Of all the places we ate, Mr. T’s Pizza and Ice Cream had the best pizza we tasted in Chattanooga. I can’t guarantee it’s the best in Chattanooga, but it’s the best we had, better than the pizza at the Silver Diner at the Chattanooga Choo Choo Hotel and far better than the pizza at the Tennessee Aquarium or the Applebee’s downtown. Service was quick and friendly. The pizza was delicious, and the prices were reasonable. In a tourist area, one expects the prices to be higher, but they weren’t. Mr. T’s Pizza and Ice Cream is in the St. Elmo neighborhood, at the foot of Lookout Mountain, directly across the street from the Incline Railway, the world’s steepest passenger railway. Mr. T’s Pizza and Ice Cream is at 3924 Tennessee Avenue, Chattanooga, TN 37409. It’s easy to find because of the big ice cream cone on top. There is a small parking lot with free parking (a blessing in a tourist destination like Chattanooga). We had to park on the street the first time we went, a Sunday afternoon. When we went back on Wednesday to try their ice cream, we were able to use their parking lot. Ice cream prices were comparable to Dairy Queen or Baskin-Robbins. My son especially liked the Deer Tracks flavor, vanilla ice cream with a fudge ribbon and peanut butter cups. If you go to Chattanooga, riding the Incline Railway is a must-do. Ride it up, admire the view from Lookout Mountain. Walk to Battles for Chattanooga and Point Park. Buy souvenirs. Ignore the pizza for sale at the top railway station and the ice cream parlor at the bottom of the railway. Once you’re done sightseeing, go across the street to Mr. T’s Pizza and Ice Cream. You’ll appreciate the quality and the price. My son is planning to attend University of Tennessee at Chattanooga (UTC) and be a Chattanooga Moc, so we’ll be returning to Chattanooga. When we do, we’ll be returning to Mr. T’s Pizza and Ice Cream. I am a fifth-generation Republican, but I can not support Donald Trump. The San Diego Union-Tribune can’t, either. They suggested San Diegans write-in the late Ronald Reagan rather than vote for Trump. North Korea, however, does support him, and Vladimir Putin seems to like him. Both “endorsements” are marks against Trump, in my opinion. He is not a true Republican, although he has tried to pander to the ultra-conservative right wing of the party, to get them to overlook his philandering and adultery. Trump has insulted people he should be working with, not against. He is sexist, and will probably have few, if any, women in his cabinet. Overseas, the new mayor of London accused his political rivals of using Donald Trump’s playbook. What does it mean for international relations when a potential president’s name is used as a pejorative? Donald Trump neither understands nor respects the Constitution. He does not respect anyone but himself. His opinions change on a weekly, if not daily, basis. He’s biased against women, racial minorities, and Moslems. We can’t endorse Trump for reasons we’ve documented repeatedly: belligerence, casual cruelty, incoherence on policy issues. Call me old-fashioned, but I don’t think president of the United States should be an entry-level position for someone considering a career in politics. Donald Trump lacks the experience, judgment, and moral compass to be president. I urge you to vote against him, as do Stephen King and Amy Tan.